KATSU-DON is the Japanese-style dish which has a pork cutlet and an egg on hot boiled rice. The texture of the pork cutlet into which delicious broth sank is very good. The word Japanese "KATSU" has the meaning "a victory." Therefore, many Japanese young men often eat this just before a sporting event. 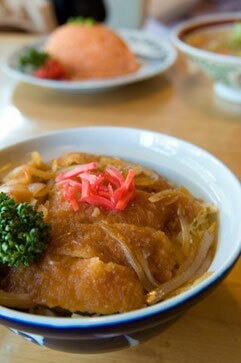 If you also eat delicious KATSU-DON in Japan, wonderful energy will come out of you. She has sung now for Tohoku district support. The song "TSUBASA:The Wing" has connected the Tohoku district, Japan, and the countries in the world with the ring of support. Her heart-warming singing voice has encouraged all the people. You can buy this CD only at the following site and the concert hall. It sells only in Japan.